Initial work at OKB-1 focused on vertical flights of a single person on a short "suborbital" trip using the scientific version of the military R-2 ballistic missile. Under the technical leadership of engineer Nikolay P. Belov, similar work was being carried out by Tikhonravov at another scientific research institute, NII-4. This work continued from 1955 for some years, until the advent of the larger R-7 indicated that higher and longer flights into orbit were possible. Running simultaneously to these studies were efforts to place the first satellite into orbit, which resulted in the launch of Sputnik 1. This satellite, however, was not the original choice for the pioneering mission into space. "Object D" was the fifth (in the Russian alphabet) to be assigned for launch on the R-7, after four nuclear warhead variants. This was an unguided artificial satellite, with a mass of roughly 900-1,350 kg and a scientific payload of 200-300 kg, planned for launch by 1957, within the eighteen months of the International Geophysical Year. Identified as the "simplest satellite" in early planning, it was far more complicated than envisaged, resulting in delays and the fear that the Soviets might lose the race to place an object in orbit to the Americans. Korolyov decided to delay Object D until a simpler design had been launched to achieve the goal of becoming the first artificial Earth satellite. Simple Satellite 1 (PS-1) became Sputnik 1 and a month later, PS-2 was adapted to include a canister for Laika and a suitable life support system. The original payload intended as the first satellite was finally launched as Sputnik 3 on 15 May 1958. At the same time, studies and designs for a vehicle that would support a human in space were being pursued in the Planning Section of OKB-1, based on designs for an unmanned reconnaissance satellite codenamed Object OD-2. By 22 May 1959 this was renamed "Vostok", now a programme of several variants including Object 1K (Vostok 1), the unmanned research and development experimental version; Object 2K (Vostok 2), which would be the unmanned reconnaissance satellite; Object 3K (Vostok 3), the design intended for manned space flights; and Object 4K (Vostok 4), a design concept for an unmanned spacecraft with high resolution photographic capability. By April 1960, the unmanned reconnaissance satellite was renamed Zenit, while the manned variant retained the name Vostok. 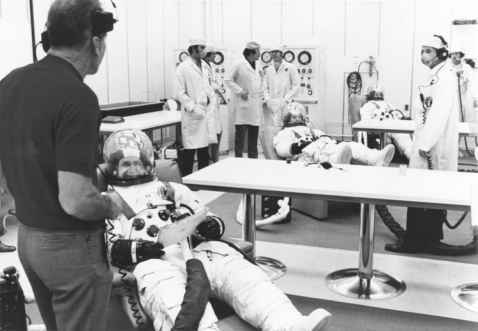 By this time, the selection process for the first group of cosmonauts was under way.